YASKAWA nd TBB Automationsmaschinen GmbH will be demonstrating a high-performance solution for the automated palletisation and depalletisation of cardboard boxes at CeMAT 2016. The centrepiece of the system is a MOTOMAN MPL100 II palletising robot. As part of the Innovative Logistics Solutions Special Show (Hall 27, Stand H02), the new joint development from YASKAWA and TBB will be seen live as part of a complete intralogistics transport line. Fitted with a vacuum grab, the robot automatically removes cardboard boxes from a Europallet and transfers them onto a conveyor belt. 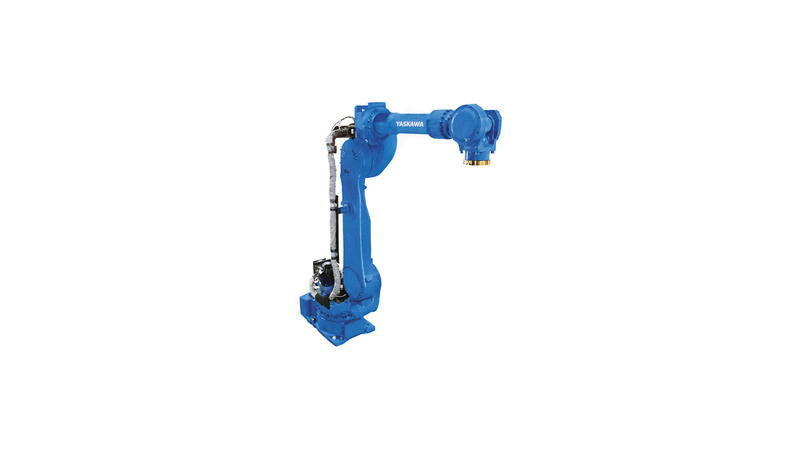 This is made possible by a powerful and particularly versatile model from the MPL series from YASKAWA. The 4 axes machines from this model range were specially designed for palletising tasks in the load-bearing range between 80 and 800 kg. The compact MOTOMAN MPL100 II covers applications weighing up to 100 kg. Its vertical range of 3,149 mm in combination with its horizontal range of 2,150 mm allows high palletising loads to be achieved, as well as a large working area with 1,500 mm rectangular range and 1,900 mm stack height. Thanks to its high level of dynamics, it is ideally suitable for palletising bags and cardboard boxes, picking, and a host of other application areas in the logistics and packing sector. As well as being particularly cost-efficient, the internal cable and wire routing from the base to the end-of-arm tool ensures a high level of reliability and few problematic contours. The MPL 100 II uses the latest controller generation, the MOTOMAN DX 200. The integrated safety controller also makes this high-performance controller a category 3 functional safety unit (FSU). With up to 32 definable safety zones and 16 possible tools, it facilitates smaller work areas and the optimum utilisation of the available production space. Special show: Innovative Logistics Solutions in hall 27, booth H02.